Yorkshire's Jack Brooks (left), Adil Rashid and team-mates celebrate the win. HAMPSHIRE are one of only two teams to have chased 400-plus to win a match at Headingley. They knocked off 404 against Yorkshire in 2006 – the same total which Bradman’s Invincibles managed in the 1948 Ashes Test, Bradman contributing an unbeaten 173. Lightning was never likely to strike twice for Hampshire once they had been set 449 to win this game, and so it proved. Reeling on 37-4 going into day four, they were dismissed for 143 as Yorkshire wrapped up victory at 2.40pm. The champions’ second win – to go with two draws – lifted them to third in the table, nine points behind leaders Middlesex. It was the type of convincing performance they served up last summer, when they won eight of 16 matches – five by an innings. Boosted by the return of their England players (or three of them, at any rate, in the form of Adam Lyth, Jonny Bairstow and Adil Rashid, with Liam Plunkett dropped for missing a team photocall and training session prior to the match), Yorkshire were predictably too strong for their newly-promoted rivals. Sterner tests will come, but this was perhaps the first genuinely commanding display that Yorkshire have delivered this season. The only damage inflicted on Yorkshire yesterday, in fact, came during the pre-play warm-ups. Tim Bresnan took a boot in the face from Jonny Moxon, the 22-year-old son of director of cricket Martyn, while the cricketers were playing football in front of the pavilion. 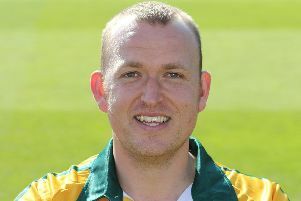 Bresnan sustained a cut to the side of his head and left the field for treatment with Kunwar Bansil, the club physiotherapist. Although Bresnan recovered to play a full part in proceedings (the cricket not the football), play was halted briefly when the wound re-opened. Bresnan is a tough character, and after Adil Rashid had bowled nightwatchman James Tomlinson, who stopped for several seconds on his way back to the pavilion to rehearse painstakingly the forward defensive shot he should have played, Bresnan captured the important wicket of Sean Ervine. The batsman pushed forward to a delivery that feathered the outside edge and ended in the safe gloves of wicketkeeper Jonny Bairstow. It left Hampshire 67-6 after 50 minutes’ play and put paid to any fanciful hopes of survival. Not that Hampshire simply rolled over and died as some thought they might. Will Smith, the 32-year-old right-hander, who started the day with 18 to his name, reached a patient half-century just before lunch, made from 155 balls. Smith and Lewis McManus, the debutant wicketkeeper, were somewhat improbably still together at lunch, having lifted the total to 114-6, and they coped well with everything that Rashid threw at them during a morning in which the leg-spinner bowled unchanged from the Rugby Stand end through 18 overs for 32 runs. The partnership was finally broken half-an-hour after the interval. McManus, playing back to a ball from Will Rhodes, got an edge that was smartly taken by Bairstow, moving to his right. Smith and McManus had added 56 in exactly 100 minutes. Rashid returned to account for Gareth Berg, who swept him to backward square-leg, where Brooks took an excellent diving catch, low to his right. It brought to the crease serial slogger Andre Adams, who had perished in the first innings to a ridiculous slog, and he lasted only one ball second time around. Rashid lured him forward and he edged to second slip. Rashid was denied a hat-trick but finished with 4-48 to go with first innings figures of 4-70. Brooks took 3-31 to finish with seven in the match in another impressive display, stepping up well in Plunkett’s absence. Bresnan and Steve Patterson were typically tidy, the latter ending proceedings when he had Fidel Edwards caught at first slip. The margin of 305 runs was only the ninth time in Yorkshire’s history that they have won by 300 runs or more. The champions, it is safe to say, are beginning to find momentum. Yorkshire have confirmed that Australia all-rounder Glenn Maxwell will arrive on Sunday and make his debut in the T20 Blast game against Nottinghamshire at Trent Bridge tomorrow week.